Just before German Chancellor Angela Merkel and French President François Hollande came for negotiations on Ukraine to Minsk, Belarusian Foreign Minister Uladzimir Makei visited Germany. The foreign minister's trip on 5-8 February was just one of numerous steps that the Belarusian government is taking recently to repair its relationship with the West. This has had some success. Lukashenka's “role in the attempts to resolve the conflict in Ukraine made us to look in another way at the leader of Belarus,” an official of the European External Action Service said. Given the Belarusian geopolitical situation plus that its economy is so closely aligned with Russia only gradual evolution can lead to a successful rapprochement with the West. And this process may have been launched now as the Ukrainian crisis has made Minsk and the West look at each other in a different light. Reaching Out to Old Europe? In Munich on 6-8 February, Makei met German Foreign Minister Frank-Walter Steinmeier, the High Representative of the European Union for Foreign Affairs and Security Policy and Vice-President of the European Commission Federica Mogherini, the foreign minister of Italy among others. The Belarusian government always tried to establish more contacts with so-called 'Old Europe' (Western European countries like Germany, France or Italy), who are the main protagonists in the EU and shape its policies. Sometimes Minsk scored successes with such a strategy, when for example the Italian Prime Minister Silvio Berlusconi (the first Western European leader in the history of independent Belarus) came to Minsk in November 2009. 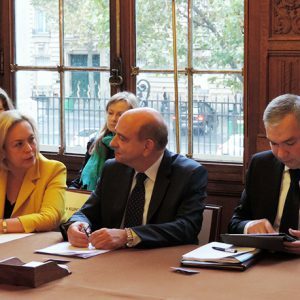 Since September the Belarusian authorities have demonstrates unprecedented activity in it's previously moribund relations with France. Against the backdrop of a series of official visits in recent months, Minsk finally managed to establish a joint commission on economic cooperation with Paris and sign an agreement on export insurance. On 2 February, the sale of the first Peugeot cars assembled in Belarus started. At the same time, Accor (a French company), known for its global Ibis hotel network, plans to start construction three hotels in the three Belarusian cities of Hrodna, Brest and Barysau. Minsk knows that it cannot ignore the United States in mending its fences with the EU. As early as the 22 September, the former Belarusian Prime Minister (Myasnikovich) met the US Assistant Secretary of State for European and Eurasian Affairs Victoria Nuland in Washington. Nuland is widely blamed by the Russian regime for the Ukrainian crisis, thus it is little wonder that when on 17 December she proclaimed US willingness to improve relations with Belarus and spoke positively about Minsk's peace efforts, it was met with an immediate Russian response. A leading foreign policy expert of the Russian government, chairman of the State Duma Committee on Foreign Affairs Alexei Pushkov warned that by trying to befriend America Lukashenka might finally face the fate of Milosevich, Qadhafi and Hussein. He also dedicated a part of his weekly programme (27 December) on Russian TV to lash out at the Belarusian leader. Nevertheless, at an extraordinary session of the Belarusian parliament on 15 January Lukashenka said that Belarus would strive to normalise relations with the West. On 30 January, speaking at a conference in Washington, Belarusian chargé d'affaires in the United States Pavel Shydlouski asked the United States to support Belarus at this time as the country's sovereignty and independence had come under threat. All in all, the Belarusian relationship with the EU is starting to improve. Currently, Belarus and the European Union are negotiating the signing of agreements on lowering visa fees and readmission at the Riga summit. However, several important questions remain unresolved. First, in visa negotiations Belarus (as usual for such agreements) wants to remove visas first for diplomatic passport holders. On the contrary, the European External Action Service insists on the requirement to ease visa restrictions first for ordinary citizens and not officials. Secondly, a representative of the Latvian Foreign Ministry in late January said that his government hopes for the “highest level of Belarusian participation” in the Eastern Partnership summit in Riga in late May. Minsk demands “equal terms,” meaning by that at least a nominal right to decide itself which Belarusian officials will attend the summit, and whether it might be Lukashenka. An official of European External Action Service told Euraradio on 2 February that the question of Belarusian representation at the summit remained unresolved. He added that it would be hard to reach an agreement on President Lukashenka's coming to Riga. He explained, “the situation with political prisoners […] will force us to suppress a lot within us before sitting down at a table with Lukashenka. And Lukashenka can easily send us an appropriate signal – to release all political prisoners.” But the issue may have to be resolved by compromise. Recently, Latvian Foreign Minister Andrejs Pildegovičs hinted at it as he repeatedly spoke about three political prisoners in Belarus. The figure remains contentious with different sides presenting different views of who should be deemed a political prisoner. Talking about three prisoners (and not six as some activists would like) Pildegovičs demonstrated a more moderate stance in hoping to reach a deal with Minsk. 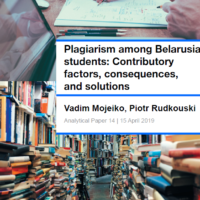 Whether such a deal can lead to further rapprochement between the EU and Belarus depends on the patience and pragmatism of both the EU and the Belarusian side. After all, the Belarusian regime is not an ideological foe of Europe. President Lukashenka talks about Belarusians as a European nation, while Foreign Minister Makei proclaims his political hero to be Otto von Bismarck. The conservative and pragmatic Bismarck presents a good example for Belarusian politicians. For decades, he worked inside Germany and avoided unnecessarily antagonising external powers to unify the German nation. Likewise, only years of modernisation could change the Belarusian economy to reduce its dependence on external powers. Only taking account of the legitimate interests and sensitivities of external powers (Russia primarily) could Belarus secure success. Although today many Belarus-Western contacts and visits concern the Ukrainian issue, Minsk, 'Old Europe' and the United States have started to look at each other pragmatically, managing to even put aside slogans, such as "the last European dictatorship" and the "aggressive NATO bloc." It may be the beginning of a new period of patient cooperation. Whilst 2014 was a bad year for the Belarusian economy on the whole, it brought in plenty of profit for Belavia, Belarusian Airlines and Minsk National Airport. Without any competition from low-cost airlines, Belavia has been able to safely modernise its fleet of planes and not lose its grip on the market. Whereas in the past the National Airport looked like a trip back to the USSR, nowadays travelling from Minsk is much more comfortable. Belavia is just one example of this shift in the industry, and it is making more money and becoming increasingly modern. For instance, passengers will have no trouble checking in using a mobile device and they even offer free meals and beverages, which is rare for short-haul flights these days. The recent growth in Belavia's profits may be unsustainable in the long-run, however, as passenger demand declines due to the unfolding economic crisis. Belarus’s only national airline will also continue losing its staff to higher-paying Russian airlines. Even if Belavia struggles, Belarusians can simply book a flight from Vilnius airport, which is a short train ride away from Minsk and is well-connected to the rest of Europe with an abundance of low-cost airlines. The plunge in oil prices has bolstered airline industry profits across the globe. The story of Belavia’s rise is more complicated, however. The success of Belarus’s national airline was driven not so much by the falling costs of fuel, but by the rise in domestic demand for travel and discriminatory laws. In the past, few could afford an international flight from Minsk due to incomes that were, relative to the price of tickets, too meagre to afford such luxuries. But today a growing number of Belarusians are travelling abroad for holiday and business. Many choose to fly with Belavia. The state-owned company has also benefited from protectionist economic policies. The absence of competition from low-cost European companies such as Ryanair or Wizzair allows Belavia to modernise in a safe and secure environment. According to aviation expert Aliaksiej Marchuk, if Ryanair and Wizzair want to fly from Minsk they need to agree to a whole series of burdensome regulations with the National Airport and Belavia. The most important aspect of this being the fact that Ryanair and Wizzair would have to be serviced on the ground by Belarusian Airlines. This means that Belavia engineers will provide all technical support to low-cost airplanes. Workers from Ryanair or Wizzair will have no right to. Given the obsoleteness of Belarus’s aviation carriers and infrastructure, modernisation is one of the key first step towards improving the airline’s image. Modernisation has dramatically transformed the appearance of Minsk National Airport. Prior to the 2014 renovations, the majority of comments on Foursquare, a discovery service mobile application, had described the airport as being in a shameful state. Dark and deserted, the airport building lacked escalators, cafes, and resting places. Following the recent modernisation, funded by a loan from China, the airport has obtained a broad range of conveniences, including a gym for customers. The airport’s external infrastructure is also being improved. Over the next three years, a new runway will be built at a cost of at least $300 million, Aliaksiej Marchuk told Belarus Digest. This modernisation push is being accompanied by an increase in clientele numbers. Over a 10-year period passenger traffic via Minsk National Airport has increased fivefold. In 2014 2.6 million people visited the airport. Belavia had a number of notable achievements in 2014. The airline transported nearly 2 million passengers, a 22.3% increase from the previous year. Its cargo loads grew 9.6% from the previous year. The company earned $15 million in 2014, making it one of the highest earning Belarusian state-owned companies at present. At the same time, the airline has invested into renewing its ageing fleet. The company acquired two new Embrayer-195 planes and three used Boeing 737-300 planes. In January 2015, Belavia bought a Boeing 737-800; four more Boeings are slated to arrive by 2016. The new aircraft are set to replace Belavia’s older TU-154Ms, thus bringing an end to Belavia’s reliance on aircraft produced in Russia. 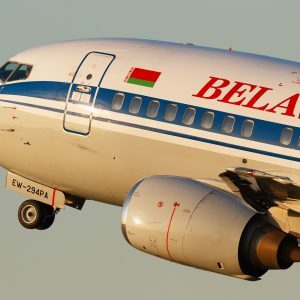 Despite the respectable age of Belavia’s current aircraft, the airline has acquired an image as a safe transportation provider. Belavia’s only major accident happened in 2008 in Armenia when passengers and staff were safely evacuated from a plane that had overturned and caught fire during takeoff. The company’s image continues to improve. In 2014 Belavia finally launched its own online reservation system. Belavia’s customers can now check in using mobile phones. What is more, bucking the current trends of Europe’s low-budget airlines, Belavia’s flights include a free beverage and meal service. Due to these improvements, Belavia can now compete with low-cost companies that fly out of Vilnius. For example, a round-trip flight from Minsk to Warsaw now costs €99, cheaper than a direct train. One can also buy a round trip flight from Minsk to London for a mere €244. With some help from Boeing specialists, Belavia has engaged in a rebranding exercise. During the Christmas holidays, Belavia’s stewards were dressed up as Santa Claus and Snow Maiden (Snegurochka), another traditional holiday figure. To improve its image with younger customers, Belavia went as far as hosting a concert by Belarusian rock group J-Mors on a flight to Amsterdam. How much can Belavia grow? Given the deteriorating state of Belarus’s economy, growth prospects are looking increasingly dim. According to various estimates, Belarus’s economy will be in crisis for at least three years. This means that fewer Belarusians will be able to afford holidays in Turkey, Egypt or Bulgaria, which are currently the top destinations for Belarusian charter flights. At the same time, Belavia will remain unable to offer long-distance flights. The airline currently lacks large aircraft, and the domestic demand for long-distance flights remains insufficient to warrant the airline’s expansion in this direction. Belarusians flying to Beijing or New York will continue to rely on foreign airlines in the near future. Marchuk told Belarus Digest that even if Belavia were to acquire larger aircraft, the appropriate infrastructure is lacking. The National Airport remains the only airport in Belarus where wide-body aircraft can safely land. If there is bad weather, large airplanes have to be redirected to neighbouring countries. For many Belarusians with Schengen visas, booking a low-cost flight from Vilnius Airport, which is accessible from Minsk by train and is often called the second Minsk airport due to its proximity, may remain a cheaper travelling alternative. Competition from Russian airlines will also remain a threat for Belavia. In 2012, Aeroflot tried to buy Belavia, and sought to prohibit it from flying to Russian cities other than Moscow. Since then the parties have reconciled, but an outflow of Belarusian personnel to Russian companies remains a problem. Aeroflot can afford to pay much more than the average $7,000 annual wage of Belavia pilots.